With an honours degree in Botany from the University of Durham and a life-long love of nature, many of Dan’s compositions have a natural theme – they are inspired by the natural world. A few examples of these are: The Spider’s Dance, Snow, As The Sun Goes Down, The Garden Waltz, April Day, Dance Of The Falling Leaves and The Dipper. Dan has also composed a number of minimalist instrumental pieces. Examples of these are Bullet Train, Long Road To Memphis, D’Accord, The Journey, Fast Train To Istanbul and Le Ruisseau Du Moulin (The Mill Stream). 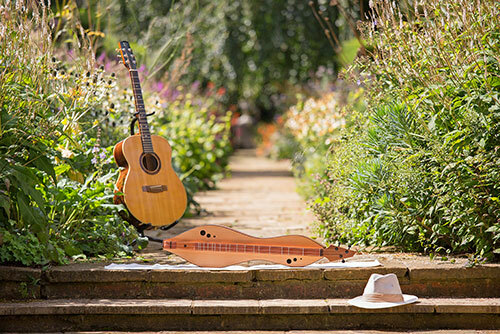 Whilst Dan’s style is quintessentially English and his roots are in folk melodies from the British Isles, his own compositions will take you on a journey around the world, from France to Italy, Turkey, Africa, Japan, America and back to Britain ~ all in a flowing stream.